For the rest of November, I’m going to take with gratitude some of those things I often take for granted — an entire alphabet’s worth! Since today is the twenty-fourth day of this surge of gratitude, I am giving thanks for “X” things. X. There is a single page in my dictionary for X, so there’s not a lot of X things to take with gratitude. I could be grateful for X-ray machines (and I am when I need one, just not today). I could be grateful for xeriscaping, and I am — elder care is hard enough without adding lawn care to the duties. I could be grateful for xylophones, and I will be if ever I get one. So what “X” thing am I taking with gratitude today? Just that — X.
X marks the spot, and this spot — this blog — is something to take with gratitude. I’ve been blogging for more than six years, and daily blogging for more than two years, and still, I find comfort, companionship, caring, and contemplation here. So I am very grateful for this opportunity. 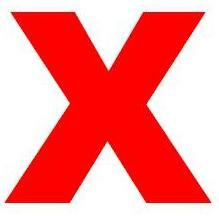 X stands for the unknown, and I am grateful for all the unknowns (unknown to me, that is) who stop by. And I’m grateful to those I have come to know by their comments. You have helped make me feel at home here, made me even feel wise at times. So what “X” things are you taking with gratitude? I LOVE your attitude of gratitude! I am thankful that you wrote and posted this blog for it reminded me “In all things give thanks”! Have a “Gratitude Attitude!” I really enjoyed reading this blog, so I wanted to share it with other readers. eXisting. Very happy to be doing that.